Landscaping with stone and pavers adds charm and elegance to any setting. Whether your home is modern, traditional or somewhere in between, there are many styles to choose from to complete your garden design. Adding stones and pavers to the landscape can be as simple as placing rocks collected from around your property into artistic designs or as complex as hiring a mason to install a flagstone path. Here are some basic tips for adding stones, pavers and more to the landscape. Theme gardens are growing in popularity. You can choose from among many styles, including Japanese gardens, English gardens, or other landscape design ideas. Japanese and Zen Gardens use small stones or pebbles along the pathways. Often pebbles are used to form ribbons or rivers of stones. Stone elements, including boulders or rocks, are also used to accent the landscape. English Gardens incorporate more formal stone elements, such as flagstone paths. Large boulders may be placed in long sweeps of lawn or beds to accent specific areas. Rock gardens incorporate stones, rocks, and many other elements. Small plants, such as alpine plants, are often used to create a natural look. Rock gardens are great for small spaces. There are many other theme gardens one can choose from that incorporate stones in various ways. Stones are used to accent areas of the garden, hide unsightly elements, or mark boundary lines such as beds or paths. It's all up to your taste and style how you incorporate stone into the landscape. Landscaping with stone edging provides a more formal demarcation for garden beds. Edging blocks and other stone edging can also create raised beds, which provide planting spaces set apart from the rest of the garden that are raised several inches from the rest of the garden. Raised beds make it easier for gardeners to create great soil. They reduce or eliminate walking on the soil, which can compact it. They are especially great for vegetable gardens. While most raised beds are created using lumber, stone may also be used. Creating an outdoor space adds a place for the family to gather, entertain, and enjoy the garden. Many patios are created from poured cement, but various types of pavers may be used instead. The look can be as formal or as relaxed as you choose. Slate tends to add a formal element, while naturally-colored pavers a more informal look. Pavers can also be used to great effect along walkways. Whether you choose straight lines and hard edges for a modern pathway, or a meandering flagstone path for an English garden look, pavers make great walkways. Some pavers are used with cement to link them together, while others lay pavers with pebbles or plants, such as Irish moss. Because stones and pavers may become part of your landscape for many years to come, you'll want to take your time selecting the styles that go best with your current or future garden. Here are tips to help you choose the best pavers and stone for your landscape. Stone colors and types vary from location to location, so pictures you see in magazines and websites may not be as easy to recreate. Visit several stone yards, building supply or garden centers near your home to see the most readily available options in your area. Stone and pavers shapes may be either regular and symmetrical or natural and irregular. Regular, symmetrical stones are called cut stones. As the name implies, they are trimmed by machine to neat shapes. They tend to be more expensive than natural stones, which are left in their natural shapes. Choose cut stones and pavers for formal landscapes. Choose natural stones and pavers for an informal look. Stones may be connected using cement or pebbles, or left with soil between them. Cement or other mortar creates a formal, polished look. Soil encourages weed growth. You can encourage garden plants such as moss or scented creeping thyme to grow among the flagstones. Thyme smells wonderful every time you walk on it and is a favorite plant for walkways. To fuel your imagination, visit some of the following resources for more ideas on landscaping with stone and pavers. HGTV provides general advice on choosing stones and instructions on how to lay pavers. 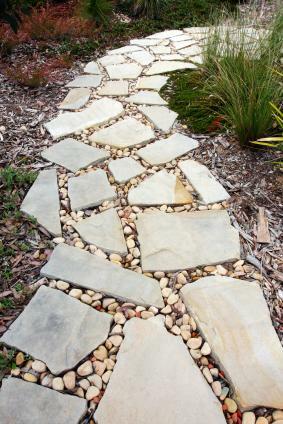 Landscaping Ideas provides many photos to help you design your own garden path using stones and pavers. Calfinder offers advice on integrating stones and pavers into the landscape.